In its latest KIDS COUNT policy report, Every Kid Needs a Family: Giving Children in the Child Welfare System the Best Chance for Success, the Annie E. Casey Foundation offers recommendations for ensuring that children in the child welfare system are placed with families whenever possible. There is no doubt that children do best in families. Nurturing and supportive families help children grow and thrive. Yet many children who enter the child welfare system do not live with families during the most critical years of development and most vulnerable moments in life. In fact, as the report highlights, one in seven children in the foster care system spend time in a group home setting. For many, group homes are their first entry point into care. More than 40 percent of these children have no documented clinical or behavioral health need that would indicate a placement outside a family setting and still many children, especially teens, end up in restrictive settings while in care. Children often end up in group placements because an appropriate family is not found. In addition, youth, mostly teenagers, may enter the system because they have developed behavioral challenges that their parents can no longer manage. For these young people, a group home may seem like an appropriate setting given that they appear “difficult to place,” will be reaching an age of majority soon, and should prepare to live independently. 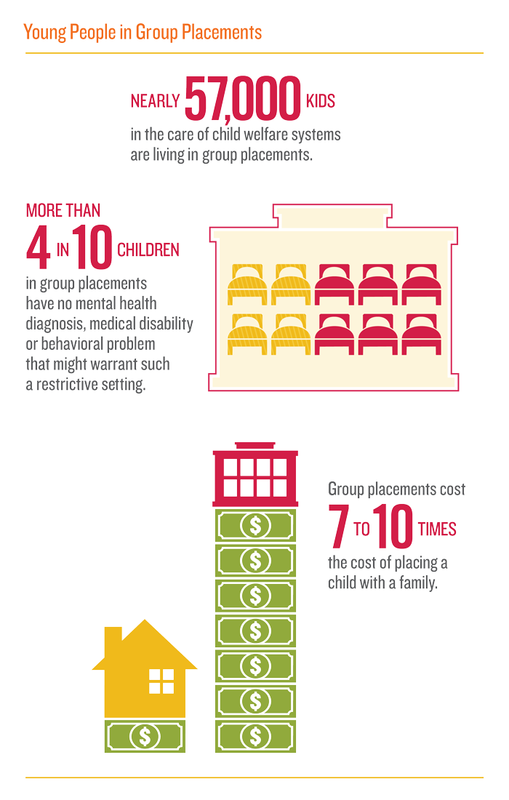 The reality is that these young people can still benefit from living in a family, and group placements should not be used as a long-term or permanent placement simply because it’s easier to house a child or teen there. However, there are some children who have complex clinical and behavioral health needs that require a short-term stay in a residential treatment facility. In these cases, group placements should serve solely as a short-term intervention and should not be viewed as a destination. Children should only be placed in these settings when clinically indicated and for brief periods of time – no longer than three to six months – to allow them to receive the therapeutic interventions and services they need. Ultimately, when possible, children should receive treatment and services within their own homes, through services provided in their communities that focus on keeping children with their families. In instances where a stay in residential treatment is necessary, it is important that the stay is considered temporary and as an intervention instead of a permanent placement. It is also critical that we support a young person’s relationships with families and social support systems during this period and ensure that these ties are not severed as a result of their stay in group care. We all recognize that children who enter the foster system face unique challenges and carry histories of early traumas that must be recognized and addressed. In order to ensure proper care and support of these children, every effort should be made to place children with kin (relatives), as these placements will help keep children connected with their families. In addition, kinship caregivers and foster parents should be trained and provided with the necessary tools to help children who have experienced trauma and/or frequent disruptions in their lives to ensure that children are getting the supports they need within the family setting. It has been shown that kinship caregivers and foster parents develop deeper connections with children in their care than relationships with adults in group homes. Policies at the federal, state and local levels should strive to ensure that every child has the opportunity to live with a loving family, as all children deserve a family that supports them and provides a stable nurturing environment that helps them thrive and grow into confident and capable young adults. Want to get involved? You can support our work on child welfare by making a donation or joining our mailing list to receive updates and action alerts on these issues.